So, not so long ago, I had a blog that I (somewhat) regularly updated called Kelly's Kitchen. I have beyond neglected that blog and was feeling bad about it, but not bad enough to go update. So, instead, I have decided to add a food series to my new blog. Kelly's Kitchen isn't going anywhere (mostly because I use it when I need a recipe and can't find my printed copy...), but future food posts are going to be featured here as Sunday Suppers. Each Sunday, I will share a recipe or meal that we had during the week. I think by having a standing deadline for myself, I'll be more likely to share the recipes and meals that I have been meaning to share for some time on Kelly's Kitchen. Cooking is one of my passions, so I should have some good stuff to share! If you have one you'd like to share, too, let me know in the comments. I'd love to either link to your own Sunday Supper, or share your recipe here! Today's meal is our own Easter dinner. We had planned to have a picnic in the park, but due to some untimely rain, were forced inside. 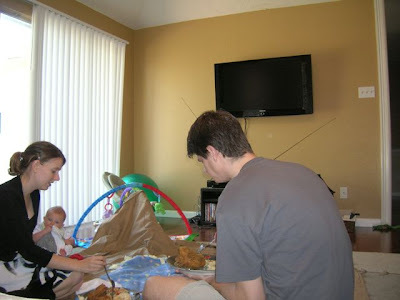 We made do by having an indoor "picnic" in the family room, spreading out blankets on the floor. It was still fun, and the weather cleared up later so we were able to take a long walk around the neighborhood after dinner. 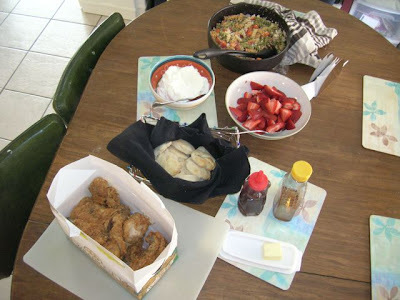 For our Easter dinner, we had some help from the Kroger deli with the main course: fried chicken. Because what better picnic food is there than fried chicken? From the top, the rest of the spread consisted of: Greek pasta salad, homemade almond whipped cream with fresh strawberries, and homemade buttermilk biscuits with butter and local wildflower honey. 1. Cut butter into flour until course crumbs are formed. 2. Stir in buttermilk until dough forms. 3. Dump dough onto floured surface (use all-purpose flour, not self rising to prevent bitter flavor from the leavening in self-rising flour...) and knead dough a few times until workable. 4. Press dough into circle about 1/4"-1/2" thick. 5. Cut dough using round biscuit cutter and place circles onto baking sheet so that edges are lightly touching. Brush tops with melted butter. 6. Bake at 500 degrees for 10-12 minutes. 1. Cook pasta al dente. Drain with cold water. 2. Mix pasta with all ingredients, except feta. Add dressing and toss to coat (use more or less, to your liking). 3. Just before serving, stir in feta cheese. I wrote a detailed post about this on Kelly's Kitchen. Instead of rewriting it here, I'm just going to link to it. If you would like to check it out, you can find it here. Our make shift picnic, above. Not wanting to be left out, Lincoln is eating his burp cloth. Not pictured is Wembley, who made sure vacuuming wasn't necessary afterwards. Hope you enjoyed this first edition of Sunday Suppers! Don't forget to let me know if you have a supper to share! What a great idea....deli chicken! Hope it was as good as the deli makes here in Omaha. An indoor picnic....a great way not to let the rain spoil your fun.